There is no better way to set up a screen than with a TV swivel wall mount. These units allow you to hang 17-75 inch screens wherever you want - there are even ceiling mounts. 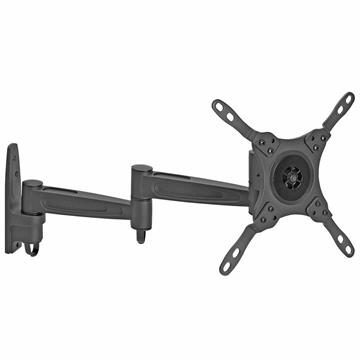 Wall mounted TV brackets swivel to different angles, usually up to 90 degrees in either direction. Available mounts can accommodate TVs that are 17, 19, 21, 23, 25, 27, 32, 37, 42, 46, 48, 49, 50, 52, 55, 58, 60, 63, 65, 75 inches in size.